Last month I was introduced to Julep Nail Polish. I really liked all of their fun nail polish colors and the unique long, square bottle it comes in. They are fun. And I like things that are fun and unique. Admittedly, I am not someone who collects nail polishes in all sort of different colors. But when I do find a color I like, I hold onto it and use it repeatedly because I like to stick to the same colors when it comes to doing my nails. I never saw myself as signing up for a Nail Polish monthly service, but the Julep Maven box piqued my interest in the same way I was initially drawn to Birchbox. I took their Nail & Beauty Quiz to find out what my style preference was and I got Classic with a Twist. Yup, that actually sounds a lot like me! The Julep Monthly Maven Box costs $19.99 a month. I used the code FREEBOX and got my first box for free (and you can too if you use that code. Click here for more info). But the box was not entirely free. I did have to pay $3.99 for shipping of my box and I also had to give Julep my credit card number. So if I decide not to keep moving forward with the monthly subscription, I am going to need to remember to cancel right away. 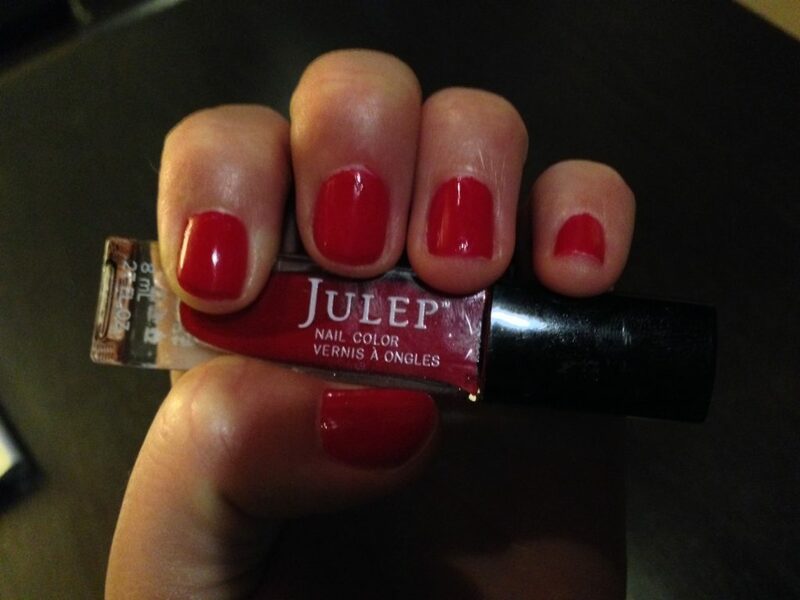 One of the nail polish colors that was recommended to me in my Julep Nail Polish box was the Red Myrtle color. It’s a really pretty red and it’s the color my latest manicure is in. I really like it. The nail polish gives a nice coverage too – my nails have been this color for over 24 hours now and I have no chips. This is a big deal for me, people. With how active I am, I normally can barely keep a manicure without it chipping for a couple hours. So I’m very happy with how well my manicure has stayed nice even while I am active. Overall I am not someone who gets really excited about nail polish but I really enjoy the Julep colors and it is something I thought would be fun to try out. The next one I have my eye on is a mint color, and I am hoping I can request certain colors in my box for next month. Even if I can’t, it is still fun and worth the surprise. I enjoyed my Julep Maven Welcome box and will likely get one more that I pay the full $19.99 price for just to see if I continue to like it. From there I will let you know if I continue as a Monthly Maven Member. If you are interested in getting your first Julep Maven Box for free , click here and enter FREEBOX at checkout. Note that you will have to pay $3.99 for shipping. What about you? Have you heard of Julep? Have you used them? Post in the comments and let us know. **Disclosure: This post contains affiliate links. I purchased my own Julep Maven box (well, only the $3.99 for shipping) and am reviewing my experience. Looks like a really pretty red! I have a lot of OPI, Essie, and Butter London polishes but haven’t taken the time to pain my nails since Nov/Dec. I just received my first (and Free) Julep Maven box but have yet to try the colors. My only concern is that when I called to cancel my subscription the gentleman I spoke with said that their colors work best on top of their own base coat. Something about the concentration of chemicals in other polishes can eat away at their colors, causing them not to look as good. I’m curious if anyone that has already tried their polishes, with some other brands base/top coats, has had any complications/issues. Thanks! PS I got the Halloween box, with a Red/Orange (Boris & Nicole Bombshell), Shimmer Purple (Queen Anne – It Girl) and Black (Jet – It Girl). <3 the colors so far & the bottle shapes.